Your brakes are extremely important. Having good brakes just keeps you out of trouble. You’ll want to carefully maintain your brakes. 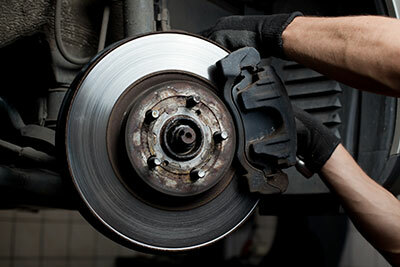 With disc brakes, brake pads rub on a disc – or rotor – to slow the wheels. The pads are attached to a caliper that squeezes the pads against the rotor. It’s kind of like how squeezing the handbrake on a bicycle pushes the brake pads against the wheel of the bike. Doylestown Auto & Truck Brakes RepairPads just wear away with use – kind of like a pencil eraser wears out. The good news is that replacing brake pads is a straight-forward repair. If you hear squealing or grinding when you use the brakes, have your service advisor check them out. He’ll have a technician perform a thorough brake inspection to see what needs to be done. He’ll check for signs of brake problems and go over other brake components to see that they’re working properly. The new pads we put on your vehicle will restore your brakes to manufacturers’ specifications. Or, we can install upgraded parts to increase your stopping power and reduce brake noise and brake dust. We have several options to meet your braking requirements and your budget.